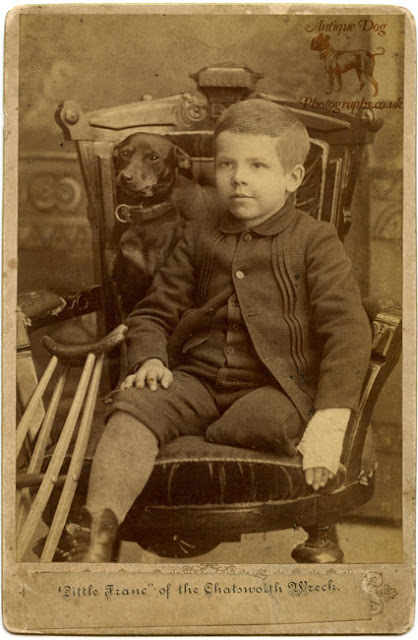 This photograph depicts Frank Snedaker, who on August 10th 1887 suffered a great tragedy. 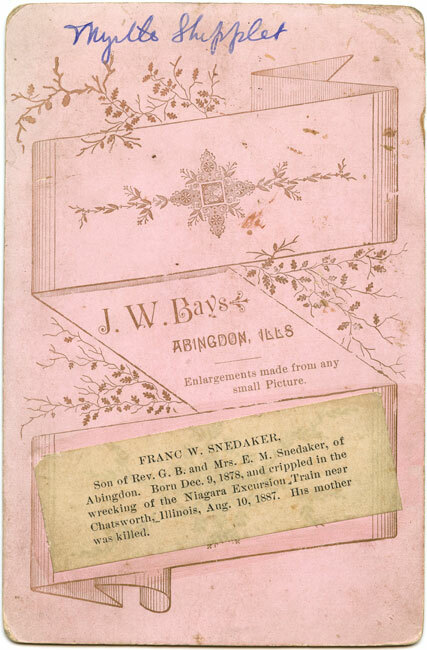 At nearly midnight on that fateful night Frank was travelling home on a train from Niagra Falls excursion with his parents, Reverend George B. Snedaker and Elizabeth M. Snedaker, when a fire on a small bridge on the line cause the whole train to crash. The train passed through Peoria at 11:45 p.m. Three miles further along on the road there was a shallow "run," not more than fifteen feet wide and ten feet deep, which the recent drought in that region had made dry. This was crossed by a wooden trestle bridge supported by timbers. As the train approached this it was running at the rate of thirty-five miles an hour with a clear track. Just before reaching it the engineer of the forward engine noticed flames licking up through the wooden structure, but too late to stop the train. 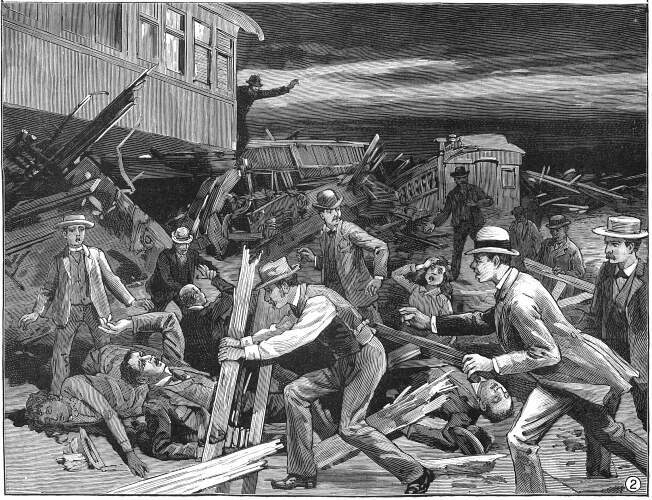 His engine crossed the gulch, but the burning bridge gave way, the tender broke from the engine and fell in, the second engine ploughed furiously into the farther bank, and cars came crashing with terrific force upon one another, telescoped throughout their length, and piled in splinters over the broken and burning trestle. The sleeping-cars stopped short of the horrible gap, but were badly shaken up. The scene that followed it is impossible to describe. The hapless passengers of the forward cars were, almost inextricably mingled in the shattered mass. 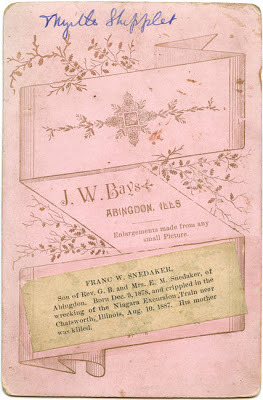 Little Frank Snedaker, of Abingdon,Ill., is domiciled. No braver person was in the ill-fated train than this little fellow. His leg was amputated, his arm is broken, and his eye injured. His mother was killed and his father has gone home with the remains, and will return. Mrs Kipp, of Wing, Ill., a cousin of Rev. Snedaker, is with the little hero. He was very restless at the hour of our reporter's call, but all hope for the recovery of this brave little fellow, who said when asked at the time of his rescue, "I'm not hurt much, help those who are crying first." 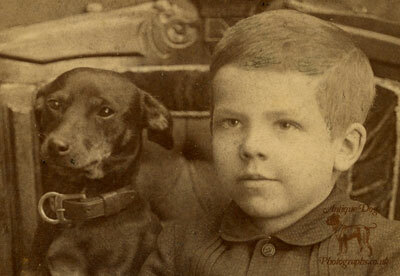 We can only hope that Frank's little dog was a source of comfort to him at such a difficult time. Frank had older sister called Myrtle, who married Joseph M. Shipplet. Interestingly on the back of this photograph is written Myrtle Shipplet - was this photograph now in my collection, once the possession of Frank's sister? We can but wonder. Goodness - what a story! The way I read "His mother was killed and his father has gone home with the remains, and will return", his father survived but went with the remains of his wife (to bury her) and came back. Still... the story is so tragic - I'm sure the dog was a great comfort to the brave little guy.